Within the next month and a half, owners of the DROID RAZR, RAZR MAXX and XOOM 3G/4G will have official Ice Cream Sandwich on there devices, straight from Motorola. Their timeline for updates was updated this morning, finally putting dates on the U.S. variants of many of Moto’s phones. The DROID Bionic, DROID 4, and XYBOARD tablets will all see updates by the end of Q3. 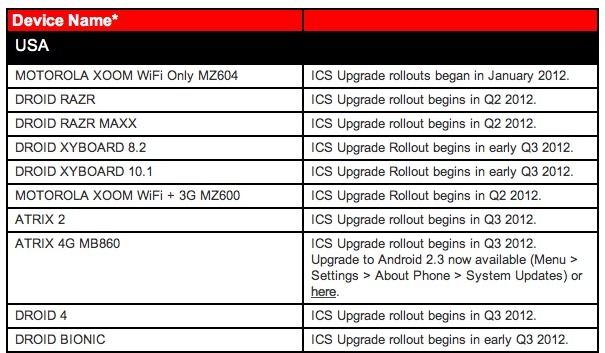 This newly updated list also confirms that the DROID 3 and DROID X2 will remain on Android 2.3 for good. In other words, a couple of phones that have been around for less than a year are already done receiving support other than bug fixes. Cheers Captmilk, Mark and Kevin!